The goal of preventing transmission of Healthcare Acquired Infections (HAIs) begins with its most important element in the process, proper hand hygiene. For a variety of reasons, the lack of hand hygiene compliance has been identified as the greatest contributor to the problem. For years, governing organizations like the CDC and NIH have made this issue one of their top national campaigns, however, current direct observation methodology has not produced the desired outcomes, even with continued education. And while new standards and guidelines have cleared the way for developing a complete national hand hygiene plan, no singular method has been established. As a result, leaders have created their own individual procedures, which vary, making compliance more difficult to measure and achieve. Attention to this matter from strong Public Health awareness has revealed a challenge to create an absolute way of monitoring every staff individual's compliance. Technological advance allows for automated solutions from start to finish providing compliance above 98%, so we can soon see a positive shift in the challenge of hand hygiene compliance which resolves the problem once and for all. An industry leader is offering a new approach with fundamental technology bridging gaps, and solving the breakdowns that top healthcare leaders have been striving for among the most respected healthcare facilities in our nation. By closely examining the structure of their technology, we can identify the proper methodology for compliance at each stage of the interaction between provider and patient and utilize technology to address and ensure compliance at each stage before the provider can move on to the next step of care. Development of this technology is formulated by identifying the weaknesses in the process and considering a simple and cost-effective way to achieve straight forward monitoring solutions that any healthcare facility in the world can use regardless of size or method of hand hygiene. Speaking with Sanjay Gupta, CEO of BioVigil, he discussed their origins that began with a world-renowned cardiovascular surgeon at the University of Michigan, Dr. Steven F. Bolling, who's brilliantly simple idea would have an impact on changing the way we look at hand hygiene completely. "Dr. Bolling felt it didn't make sense that so much effort and expense are put into high-end technology to make sure providers can give the highest level of clinical care to their patients, yet a fundamental issue like hand hygiene is not addressed, which is how the idea of BioVigil came about" said Gupta." From Doctors to Nurses to EVS workers, everyone is impacted by this solution which equates to a positive culture change around hand hygiene. We really want to make sure our system works well with caregiver workflows for maximum effectiveness and adoption," he said. 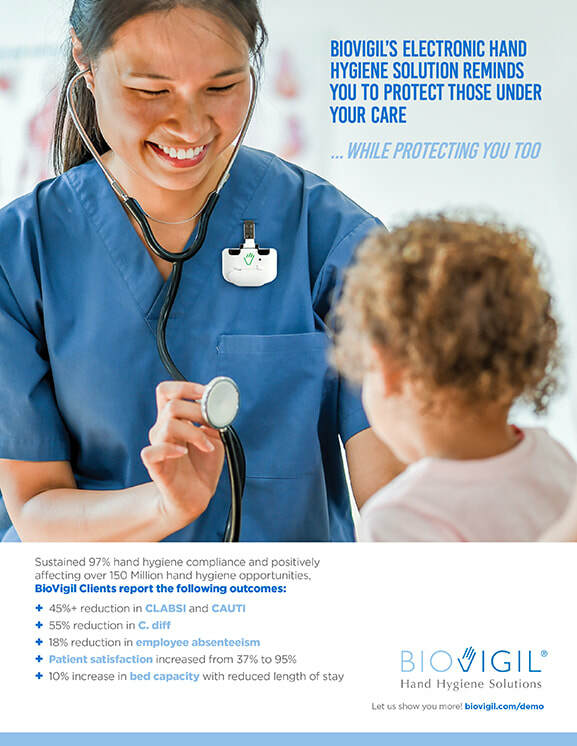 For the last two years, Biovigil has provided a simple to use, highly accurate, and cost-effective technology to among the most respected healthcare facilities with over 40 global installations, positively affecting over 150 million hand hygiene opportunities that produce meaningful outcomes. "There is clearly a link between hand hygiene and hospital acquired infections. There were close to two million HAIs in the United States last year, with roughly 100,000 deaths related to those infections every year, and the cost to the healthcare community is between $30 to $50 Billion annually," said Gupta. "This problem has existed for over 150 years, and that's why we wanted to provide a simple technology that reminds healthcare workers to clean their hands before and after patient interaction." BioVigil creates a technology network that facilitates reminders to healthcare workers, if they forget. What makes BioVigil’s technology unique is the small badge that healthcare workers wear has an alcohol sensing chip to confirm hand hygiene compliance, and data processing capabilites to automatically report compliance. The badge also detects for soap and water, which accounts for approximately 2% of hand hygiene sanitization methods for as opposed of 98% from alcohol-based sanitizers. The healthcare worker is reminded to perform hand hygiene (if they forget), and once performed, the badge validates and records compliance. “Due to our reminders, we recorded and verified a 44% increase in hand hygiene compliance across our customer base, " says Gupta. "Another unique factor about our technology is that our badge has a colored LED light in the shape of a hand, right in the middle of the badge. The hand changes color to show the stages of compliance. Green is fully compliant, Yellow is a reminder and Red is out of compliance. Most importantly, the colored light is visible to patients and families and provides assurance that their caregiver is maintaining compliance for their safety, which increases the trust between care provider and patient. This goes back to the standard of providing the patient the best level of care possible." Realtime monitoring provides the best advantage to preventing the spread of infection from one patient to another. In the case of non-compliance (red light), anyone can prevent a non-compliant worker from continuing to another patient. Preventing cross contamination has always been top of mind and having technology to ensure facilities the ability to stay in control over it is a differentiator. "Our system is not based on a certain dispenser type or brand of product for hand sanitation, but rather that hand cleaning has been completed", says Gupta, "Which means it can work in any healthcare setting. Even the most basic clinics in poorer nations around the world can verify and ensure hand hygiene compliance with our system because it has automated reminders and verifies hand cleaning to the worker and such reports can be delivered to each individual and their supervisors/hospital executives." Patient satisfaction experience is notably higher where BioVigil's technology has been implemented, with increases from 37% to 95% satisfaction. BioVigil is currently conducting studies of other patient's experiences to measure its effects and how they might be able to improve even further, as this has always been one of their initial development goals. They have noted up to 80% reduction in hospital acquired infections at the locations using their technology and even noted a reduction in healthcare workers getting less sick by as much as 18%. "We are very proud of the recent statistically significant peer reviewed article published in the American Journal of Infection Control they did a year over year study and saw a 45% reduction in CLABSI and a 55% reduction in CAUTI,” said Gupta. In terms of Public Health, having the entire community unite together for a simple and effective system-wide technology solution can truly eradicate this unmet need around hand hygiene compliance. We are committed to solving the hand hygiene problem to improve patient and staff safety, and in turn, increasing the trust between patient and provider says Gupta, "So there is definitely a need for public policy to end this problem once and for all".